Join Richard, in conjunction with Natures Images, in Japan’s winter wonderland. This stunning country offers iconic wildlife such as the Snow Monkeys, bathing in thermal pools, the majestic courtship display of the Red-Crowned Cranes and Stellar’s and White-tailed Eagles on the off-shore pack ice. Add in the search for Red Fox and Sika Deer opportunities and this trip aims to be one to remember. Photos courtesy of Natures Images. Our Japanese Winter workshop accommodates 12guests. With two guides on hand, that offers an excellent guide to guest ratio to ensure you get the very best from your experience. All levels of experience are catered for and, with two professional guides on hand, there will be ample opportunity to learn new skills. With lots of cold and snowy weather, appropriate clothing will be required. Most locations require short walks but please note, the Snow Money location requires a walk of around 20-30 minutes and may be on icy ground. The days are relatively short, keeping late nights and early starts to a minimum. Rooms will be based on twin/room basis depending on which hotel we are based. All accommodation is typically comfortable, varying in style between traditional and western. A limited number of single supplements ma be available upon request. Richard Peters is a Nikon Ambassador with a style that often favours dramatic light and contrast. He offers a relaxed, down-to-earth approach to his guiding and has won multiple international awards including twice in the Wildlife Photographer of the Year. He is also one of the only British photographers to have recieved the accolade of European Wildlife Photographer of the Year. Ellie Rothnie is a professional, and regularly published, wildlife photographer and Natures Images guide. She has been awarded in competitions such as the British Wildlife Photography Awards and Natures Best. She has a beautiful, clean, and simple style to her work which has resulted in a portfolio of eye catching imagery. As a fan of Richard Peters’ work I was delighted when my wife booked a 6 hour one-to-one workshop for my birthday. I have enjoyed taking wildlife photographs for a long time, gradually improving but realised I was taking the same old photographs. It was time for a new approach, good advice and a fresh pair of eyes. Upon arrival to our workshop, Richard bought me a coffee and we sat down to a short portfolio review. Richard looked at how I had composed, cropped and processed my images using Lightroom and suggested options and alternatives. It was a fantastic eye opener to have professional opinion and critique and Richard shared his technical skills and passion for photography, along with some methods of using light creatively. This Lightroom overview helped me learn some great shortcuts, which have since made a big improvement to my workflow. A run through of important camera settings, lots of questions from me and lots of great answers from Richard and we set off with our cameras to put the theory into practice. We soon spotted a very co-operative heron in some great light, I snapped away listening to Richards tips and it was great to see my shot then the next shot with Richards suggestions incorporated (you could really see the difference). The afternoon ended with an amazing sunset and, taking Richards advice, I waited until the sun had dropped low enough to experiment with backlighting. The 6 hours flew by and it was a fantastic day, with advice and encouragement from Richard throughout, and some great shots on the camera. Richard’s knowledge, and ability to pass it on in easy to understand ways, made this a valuable experience for me to push my photograph forward and help turn the same old photos into something new. Thank you! As a relative newcomer to the world of photography, I booked a one-to-one with Richard with only 4 months experience of using a DSLR camera. My aim was to improve my overall understanding of the different settings, including manual, with an overall objective to improve my wildlife photography (off the auto setting!) prior to my impending holiday to Africa. One of the specific issues I had been finding tricky was focusing on moving subjects, Richard soon put me on the right track and resolved this. Richard also provided me with lots of well explained advice around different camera settings and image composition, which we put into practice throughout the day. I opted for the image review at the start of the session, I found this particularly useful as it helped highlight any areas that needed development during the session and also increased my confidence through the constructive feedback. Overall the workshop was really beneficial in terms of improving my knowledge and understanding, but it was also a really enjoyable day. I would highly recommend a one-to-one to anyone wishing to develop their skills. Having seen Richard’s incredible work I was naturally a little intimidated when I initially booked my one-to-one with him. However he immediately made me feel at ease with his humour and friendly nature and our workshop had a great flow and was well thought out. What I loved the most is that it was informative yet open and relaxed. Richard is a humble and passionate photographer who was very willing to share his tips and tricks and as a result of only a few hours together, I now have a much better understanding of where I am as a photographer and the areas I need to concentrate on to improve my photographic skills. I wasn't sure going in how much benefit I would get from my workshop but it exceeded my expectations, everything was explained with great clarity and it inspired me to be more creative and confident. Richard's knowledge and demeanour left me eager to push my photography further and once I’ve hit my next set of challenges, I’ll look forward to booking in again to learn more! Richard, thank you for such a wonderful experience. Day 1: A day of travelling as it’s a long overnight flight from London to Tokyo. We will be in touch with the flight recommendations. Day 2: Arrive in Japan and then transfer by coach to the mountain village of Yudanaka near to Nagano.This will be our base for the following three nights, and will be reached during the afternoon, after a stopping for a light snack lunch on route. The rest of the afternoon will be at our leisure to allow for body clock adjustment from the large time difference. Days 3-4: Near Nagano, the Japanese Alps are famous for the beautiful snow monkeys and the photographic opportunities they offer. Native to northern Japan, the Japanese macaque is the most northern-living non-human primate, surviving winter temperatures of below -15°C. The Jigokudani hot springs in Nagano are famous for their winter visits to the spa, where the monkeys spend the day relaxing in the thermal pools to fight off the cold of the mountains. We will spend two full days capturing this behaviour, trying to photograph the monkeys with everything from telephoto to wide angle lenses. Day 5: A final morning with the snow monkeys then in the early afternoon we will head back to Tokyo for an overnight stay near Haneda Airport. Day 6: An early morning flight to the northern Japanese Island of Hokkaido, the second largest, northernmost and least developed of Japan’s four main islands.Weather here is harsh in winter with lots of snowfall and below zero temperatures. We spend the next 9 days exploring this beautiful island, visiting strategic photographic locations in search of the the iconic wildlife found here. Our first base will be at the Akan crane centre and we will be visiting during the afternoon for a photographic session ahead of arrival at our hotel base. Day 7: The red-crowned crane, also called the Japanese crane, is one of the rarest in the world. Known as a symbol of luck, longevity and fidelity in parts of its range, these cranes were thought to be extinct in Japan due to overhunting and habitat destruction. With conservation efforts they have made a dramatic recovery, with 20 birds found in the 1920’s now numbering more than 1000. The cranes are spectacular to watch as they dance, often in pairs, with seemingly choreographed dips and jumps. For two days we will look to photograph this beautiful bird at its night time roosting sites and also at the Akan crane centre where the birds are fed on a daily basis. Hopefully with the right weather conditions and if the cranes perform their spectacular courtship display we will be witness to and rewarded with, stunning images. Other possibilities here include White-tailed Eagle and Red Fox, which are attracted in at feeding times. Day 8: We will spend our last morning with the cranes and it will be an early start as we get ourselves into position at a famous roosting site along a small river. We will then transfer to our next location, which is Lake Kussharo for an afternoon photographing whooper swans. 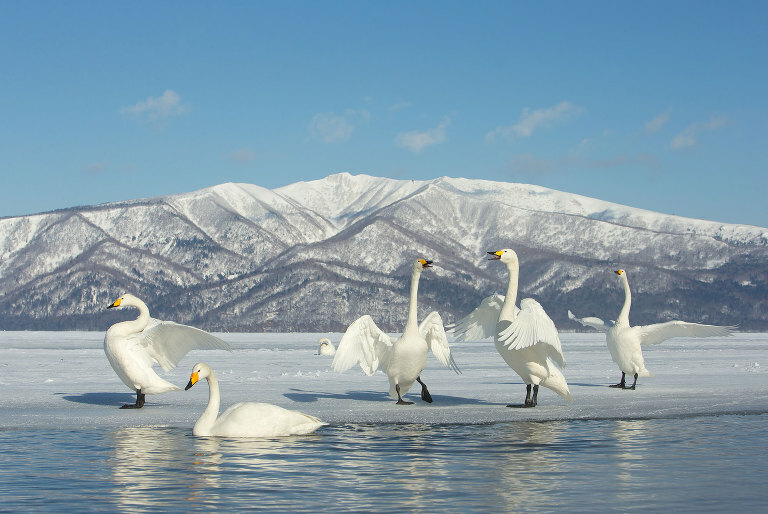 Day 9-10: Lake Kussharo is a popular stopping point for several kinds of migratory birds in the winter and is a caldera lake, fed by hot springs. This means parts of it during the winter remain unfrozen. Lake Kussharo is a perfect winter roosting spot for the swans which have been fed for many years, and so they are very tame compared to other populations. This is without doubt one of the best places in the world to photograph this beautiful species. We will have all of our first day here to explore the lake and try different techniques in capturing images of these graceful birds. On the second day we will transfer to Rausu during the afternoon which will be our base for the next two nights. Day 11-12: These two days will be based in Rausu where we will be going out each morning on a chartered boat in to the Sea of Okhotsk. Here we will sail into the pack ice looking for Steller’s sea eagles, where many migrate from their breeding grounds to the southern Kuril Islands and to Hokkaido, where food is more plentiful. This very large, powerful eagle spends the winter around the coasts or on the pack ice. The birds are attracted to fish that is thrown out for them. This really is one of the highlights of this remarkable trip and we shall be doing two consecutive boat trips each morning to maximise our potential for imaged of this impressive bird in the stunning environment. White-tailed sea eagles are also attracted to the bait so both species will be possible. On the afternoon of the first day here we will travel to Notsuke Peninsula, which is a good place to look for Sika Deer and Red Fox. After our second mornings outings though we will head back to Lake Kusharo where we will spend our final night near Lake Kussharo. Day 13: A final morning with the whooper swans before we transfer to Kushiro airport for our flight back to Tokyo, where we stay over-night near Haneda airport. Day 14: From our hotel we will catch a flight from Haneda airport which given the time differences will arrive back in the UK later the same day. A deposit of of £575 is required at the time of booking. Book your space now via the Natures Images booking form.